One good thing about meeting up later in the afternoon was the menu. Specifically, it is extremely limited with only 6 choices. Why good? Uh, I wasn't hungry and the Foodbuzz gala dinner was up next! Sure, we didn't get to sample anything substantial; but honestly, this new location of the Slanted Door is more than the food. Modern, trendy and located in a touristy area, the clientele are not only here for the food (an inadvertent jab at Kim?). 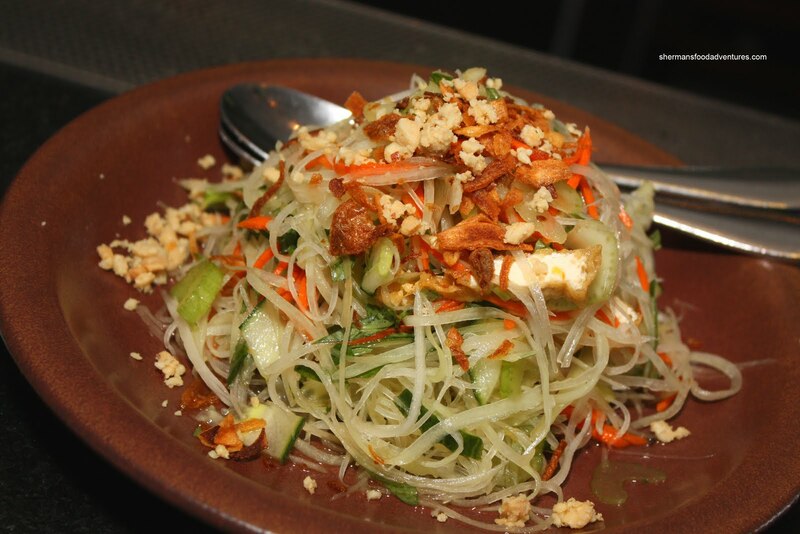 Hence, we only got a Salad Roll and a Green Papaya Salad to share. Naturally, being roughly around happy hour, we both got drinks. Our bartender did a good job and we were in Margaritaville (well, figuratively). 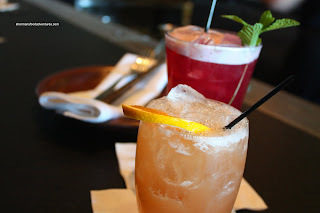 I'm not sure what Mijune had; however, my drink, Agricole Rhum Punch, was selected by the bartender. It consisted of La Favorite rhum agricole ambre, lime, cane syrup, with dashes of Angostura and allspice dram, dusted with nutmeg and served on the rocks. This was a good drink, if not a quite strong. As you can see, the Salad Roll was a smaller version you'd find at regular Vietnamese restaurants. It was a well-executed typical salad roll. No complaints. I really enjoyed the Green Papaya Salad. It was very fresh and crunchy with a tart dressing. Again, we were happy. Now, this where it gets a bit strange. While I was munching on the salad, I didn't notice Mijune chatting with the people beside us. Then, all of a sudden, we had a Vegetarian Roll sitting in front of us. WTF? Apparently, Mijune had sweet-talked her way to someone elses' food! I did not know what to say. The girl has no shame! I guess being cute and outgoing didn't hurt either. So reluctantly, I tried the veggie roll and it was pretty good. 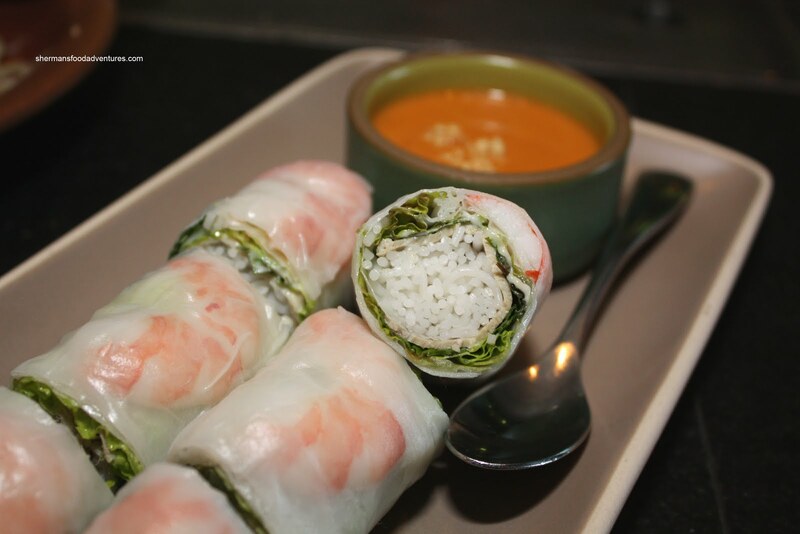 Better than the salad roll in fact. 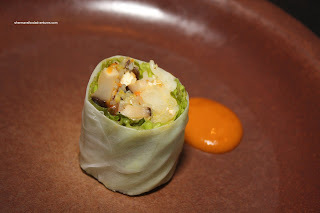 Nice crunch and I liked the abundance of shiitake mushrooms. 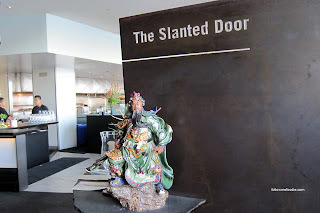 Okay, I know we only sampled a few appies, so the jury is still out on the Slanted Door. However, the items we did try were good, if not overpriced. Yet, a place like the Slanted Door isn't about being an inexpensive place for authentic Vietnamese food. The concept is strictly about ambiance, location and catering to a specific clientele. I'm probably not in that group; but for those who are, the Slanted Door delivers in that respect. For comparison purposes, one of these days, you should drop by Chau Kitchen & Bar (in Robson, a couple of doors beside Gyoza King) for your thoughts, as, aside from "fusion" places like Oru, they are about the only high-er end Vietnamese place I can think of in Vancouver (compared most pho places and unless you count Vina, but that's a complete different matter).